In the US, it’s the day after Thanksgiving today — which means it’s also now officially Christmastime! 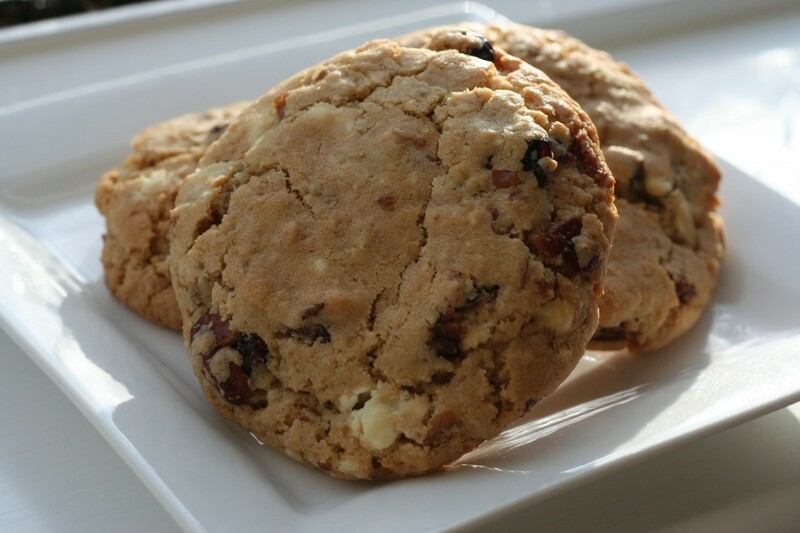 So I won’t waste any time giving you this cookie recipe, an adaptation of my favorite oatmeal chocolate chip cookies, but this time with a festive twist to them with the brandied cranberries. For any Black Friday shoppers, a couple of these cookies and a cup of coffee would keep you going through the afternoon sales. For anyone else, do you really need an excuse to eat a cookie like this? A few weeks ago, when I told a friend that I was going to make these, she said they sounded like the perfect Christmas cookie, but I said I couldn’t wait that long to make them. Any recent Thanksgiving excesses aside, you shouldn’t either. You can prepare the shepherd’s pie in advance, leave it to cool and reheat it later, although it will need more time in the oven (40 minutes instead of 20). For my family of four, I like to divide the pie into 4 individual gratin dishes and 4 ramekins for the kids’ portions, which makes enough for two dinners. This way, I can cook the second batch fresh on the day, as opposed to reheating one big casserole dish. In a large pan, gently sauté the onion in the vegetable oil for about 10 minutes, until soft but not brown. Add the mince a little at a time and cook until browned. Add the Worcestershire, thyme, tomato puree, carrots, stock and some salt and pepper. Cook on a low heat for 50 minutes, then transfer to a large casserole or pie dish or individual gratin dishes, ready for the mashed potato topping. Meanwhile, cook the potatoes in boiling salted water until tender. Drain well, then return to the pot and add the cream, butter and salt and pepper to taste. Mash well, then taste and adjust the seasoning if necessary. Cover the mince mixture with the mashed potato. Run the tines of a fork along the potato topping (this will help it to brown). Bake in the preheated oven for 20 minutes, or until the potato is nicely browned and the pie filling is bubbling. Garnish with chopped parsley and serve. You can make these cookies without the brandy if you prefer. Put the dried cranberries in a wide, shallow bowl and add the brandy, making sure all the cranberries are covered with brandy (you may need to add a bit more). Cover and place in the fridge. Allow the cranberries to soak for at least 1 hour. Place a colander over a bowl and strain the cranberries, reserving 1 1/2 teaspoons of the brandy. Set both aside. Preheat the oven to 325°F (160°C). Grease 2 cookie sheets or line them with parchment paper or silicone baking mats. Sift together the flour, baking soda, and salt and set aside. In a medium bowl, cream together the melted butter and brown and granulated sugars until well blended. Beat in the reserved 1 1/2 teaspoons of brandy, the vanilla, egg, and egg yolk, mixing until light and creamy. Mix in the sifted ingredients, working until just blended. Stir in the cranberries, white chocolate, pecans and oats by hand, using a wooden spoon. Chill the dough in the refrigerator for 30 minutes to 1 hour. Use a table knife to scoop and press the dough into 1/4‐cup measuring scoops (or roll 90 g of dough into a ball for 1 cookie), and place the mounds onto the prepared cookie sheets. The cookies should be 3 inches apart.